« Worst Vegas TV Ever? 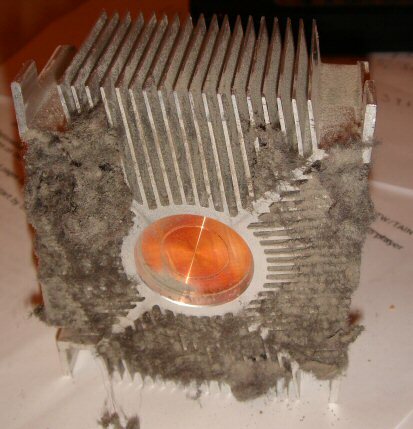 Perhaps this is the reason my PC has been overheating lately. So today I actually decided to take a look and see if there was anything obviously wrong. It was, in fact, pretty obvious. This picture shows the cooler after I’d started scraping the dust out of the fins on one side. The top was totally covered in crap and would have stopped any air from being sucked through the heatsink at all.